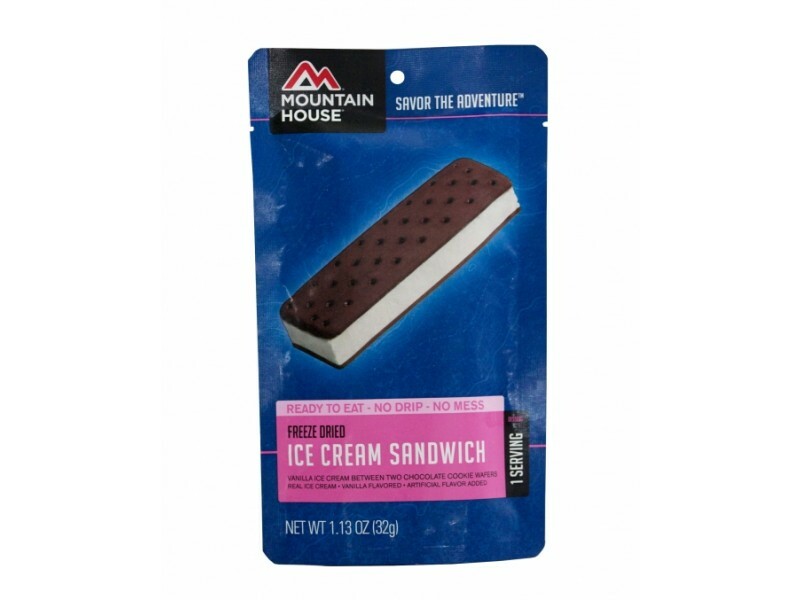 Each individual order of this ice cream sandwich from Mountain House contains one full serving. This is perfect for an individual, or for any one to give it a try to see if they like it. 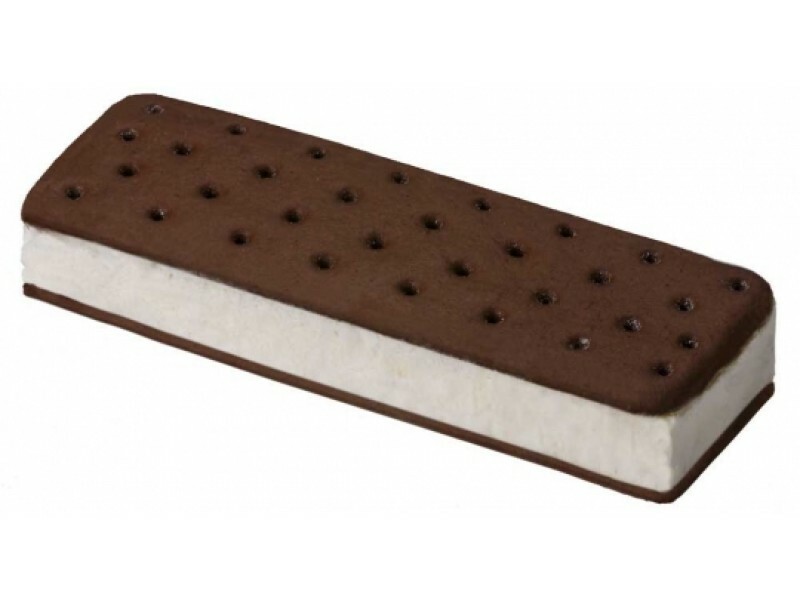 The chances are very good that everyone will love the great tasting, long lasting ice cream sandwich. 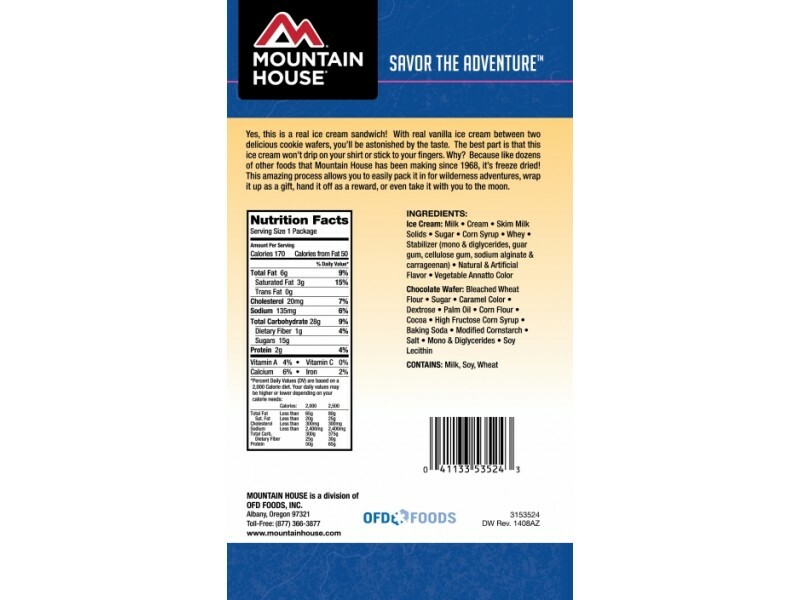 Each serving offers a total of 170 calories, 7 grams of fat, and 3 grams of protein, all of which are very important during any type of emergency situation. That means this product is not only great tasting, but a great addition to any survival plan. This is an especially popular product for people who are storing food for emergencies, and also have families. While it is critical to ensure there is enough to eat for everyone in the family, it is almost as important to try to allow everyone to enjoy what they are eating. When you can offer your family an ice cream sandwich for dessert after a meal, it will satisfy their sweet tooth as well as help them adjust to the new situation. Of course, in addition to being an excellent tasting snack for emergency situations, it is also a great item to pack to take with you on hikes, camping trips, car rides and other special events. 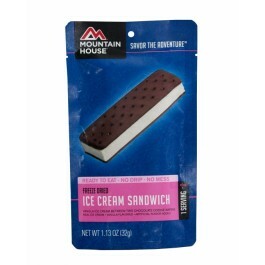 Give this great tasting, long lasting ice cream sandwich a try today. INGREDIENTS: ICE CREAM: Milk, Cream, Sugar, Corn Syrup, Nonfat Dry Milk, Whey, Mono and Diglycerides, Guar Gum, Cellulose Gum, Carrageenan, Artificial Flavor, and Annatto Color. CHOCOLATE WAFERS: Bleached Wheat Flour, Sugar, Carmel Color, Corn Sugar, Palm Oil, Corn Flour, Corn Syrup, Cocoa, Modified Corn Starch, Salt, Baking Soda, Mono and Diglycerides, Soy Lecithin. CONTAINS: Milk, Wheat, Soy. One pouch is 1 serving.